Hey everyone! Today I’ll be sharing a guest post done by Alexis Schroeder from FITnancials! She’s a full-time travel blogger over at FITnancials.com. She writes about healthy living, how to travel abroad affordably, and personal finance. She also has a free resource library filled with printables such as travel checklists, meal plan templates, and monthly budget planners. And she has some awesome tips on how to eat healthy on a budget. Enjoy! Have you ever gone grocery shopping in the past and had a mild heart attack after seeing your receipt? There’s a common misconception that eating healthy foods means spending hundreds of dollars a week on organic, fresh produce. While it’s easy to overspend when you’re shopping for healthy foods, all it takes is a little extra effort in the beginning to know what to shop for, and it eventually becomes effortless once you know your way around the supermarket. Being a college student and living on my own meant that I had to figure out how to eat healthily on a budget. It took a little practice at first, but I’ve ended up getting my bill under $50 a week. I could get it even cheaper if I wanted, but I love creating new recipes at home. Below are 10 tips for creating a healthy lifestyle on a budget. Enjoy! Most of us tend to think that in order to get the healthiest foods, we need to shop at places like Whole Foods or Trader Joe’s. While certain food products can be cheap there, it’s best to stay away from both as there are tons of “healthy junk foods” placed throughout the store. Shop at Aldi’s, Walmart, or your general supermarket. Asian supermarkets are also a great option as they have rice, beans, and other healthy foods for a fraction of the cost. If you’re not sure what foods to get, here is a list of 20 cheap and healthy foods. This ensures you only buy the necessary foods on your shopping list. You’ll end up only buying enough food to last the week, instead of loading up on a bunch of foods that will eventually go bad. There are meal plans programs available online, or you can create your own. Putting up a monthly calendar with all of your meals listed is helpful so that you stay on track and use your food before it goes to waste. Generic products are often just as good as name brand and can be marked down by 50%. Many generic products even have no added salt (such as canned corn or beans) or sugar added version of the products, which makes it even healthier. Eliminating the middle man will add to your savings by doing the work at home yourself. You’re paying for the convenience of the meal, so unless you’re in a hurry, refrain from buying prepackaged fruit, vegetables, or “healthy” meals that most supermarkets are carrying now. You’re saving a few seconds of preparation and paying 75% more for a product that is way overpriced. There is a huge difference between good and bad carbs. You shouldn’t be afraid of eating whole carbs, which include fruit, vegetables, nuts, whole grains, and potatoes. Then there are the bad carbs, also known as refined carbs. These include pastries, fruit juices, ice cream, and fried foods. Most carbs contain dietary fiber, which means you’ll get fuller faster and be more satisfied with meals. My favorite carbs include corn, oatmeal, bananas, and sweet potatoes. These foods are also some of the cheapest foods in the store! Comparing price labels can save you a few dollars each grocery shopping trip. While that may not seem like a lot, those few dollars add up each month into a few hundred dollars in savings a year. Unit pricing labels take the price of the product and divide it by a unit of measurement (usually ounces) that allows you to figure out which product is cheaper. 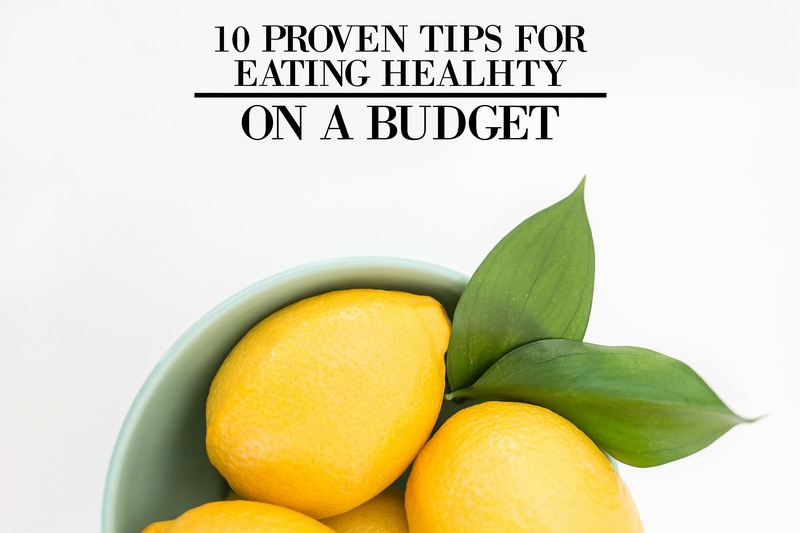 If you need some extra help on finding healthy foods on a budget, check out this list here. Another misconception about vegetables is that you should only buy fresh produce. While fresh is always the best option, frozen vegetables last much longer, cost less, and some studies suggest that nutrients stay in the produce longer since the vegetable is immediately frozen. There is such a wide variety of bagged frozen vegetables to choose from, so you won’t ever be short of any nutrients. Here is a list of some other foods that are surprisingly healthy. Substituting a few meaty meals a week with beans, legumes, tofu, or tempeh can drastically cut your grocery bill. Buying dry beans instead of canned beans cuts the price down even more. You can get tofu, beans, legumes, and produce at Asian supermarkets for much cheaper than regular supermarkets. Beans also contain a lot of fiber, iron, and help keep your digestive system running properly. The dirty dozen is a list of 12 foods you should always try to buy organic. These foods include strawberries, spinach, nectarines, apples, peaches, pears, cherries, grapes, celery, tomatoes, bell peppers, and potatoes. These foods are known for having a high level of chemical pesticide residue on the food and lower environmental impact. Organically grown food will almost always have more nutrients, vitamins, minerals, and enzymes due to the soil being kept up to responsible standards. Shopping in season allows you to save hundreds of dollars every year. A few foods that are in season year-round include apples, bananas, onions, and white potatoes. In the summer, berries, corn, grapes, peaches, and tomatoes are cheap. In the winter, dates, grapefruit, kale, oranges, and pears are cheap. You can also do a quick google search to find out which foods are currently in season. Some of the healthiest foods are also some of the cheapest foods in the store. By eating healthy foods and making smart choices, you’re helping both your wallet and health in the long run. Eating healthy foods ensures that you’re feeding your body well and keeping it strong and running properly. You’re also saving money later in life by potentially putting off medical bills, prescriptions, and higher insurance bills. Plus, if you had the ability to feel strong and healthy throughout your life, wouldn’t you want to? What do you do to save money on healthy food? These are great eating healthy tips! I totally agree that it doesn’t have to break the bank– and is so worth it for our health! When I see a product that I usually buy on sale, I like to take a quick picture on my phone of the sale sign. This way I look back later when I’m trying to decide if something is really a good deal.